Erewhon’s Gluten-Free Cereals – Giveaway! The giveaway is now closed. Thank you very much to all who entered. Patricia is the winner! Full disclosure: Attune Foods provided the cereals for review and the giveaway but did not pay me to write this post. All opinions expressed here are my own. For the giveaway, check out instructions at the end of the post. Attune Foods, makers of Erewhon cereals, offered to send me three of their cereals to test. I chose Crispy Brown Rice, Crispy Brown Rice with Mixed Berries and Strawberry Crisp Cereals. These cereals aren’t just gluten-free, they also have an ingredient list with words you know. The Crispy Brown Rice cereal’s ingredients are: organic brown rice, organic brown rice syrup and sea salt. They taste very much like their gluten-filled counterparts. The Crispy Brown Rice cereal tastes so much like the famous brand of rice cereal that I made a familiar treat with it. (See below) It’s a whole grain alternative – brown rice vs white. The version with the mixed berries is fun for those of us who put fruit in our cereal. I like whole grain cereals, but my husband is more of a sweet cereal guy. He still liked the Crispy Brown Rice with Mixed Berries cereal; he just had to add sugar to it. But then he would have added sugar to Rice Krispies. I really like the taste of the Strawberry Crisp cereal (which is appropriately named because it is crispy.) My husband also enjoyed it. My brother-in-law and teenaged niece liked the flavor but found it too crunchy. Since I always prefer cereal that isn’t too crunchy, I add milk then come back to eat it in about five minutes when it isn’t soggy but just right. What makes Attune Foods’ gluten-free products different or better than those made by other companies? We believe what matters most is what’s inside and make foods from simple ingredients, simply made. That said we use pure ingredients to make a cereal that’s tasty and boasts a short ingredient list. All of your gluten-free cereals are certified gluten-free. Since you use equipment shared with gluten containing products, what steps does Attune use to make sure the cereal produced is gluten-free? Do you routinely test for a specific ppm? Our gluten free cereals are run on shared machinery with other products that have gluten in them. That said, the machinery is thoroughly washed down in between production runs and the cereal is tested after it’s made. Currently it is tested to be less than 15 ppm but we are working to be able to test it to be less than 10 ppm. Our gluten free cereals are certified gluten free by GIG which tests them to be less than 10 ppm. 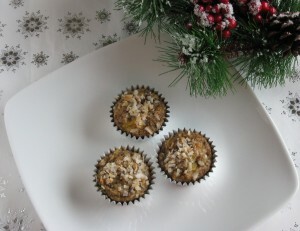 Do you have plans for any new gluten-free products in 2012? I thought a great test for the Crispy Brown Rice cereal would be Marshmallow Treats. To make them I used: a bag of Kraft Jet-Puffed Marshmallows (which were gluten-free at the time I wrote this), 1/2 a stick of butter (1/4 cup), and 5 3/4 cups of the cereal – most of the box. I melted the first two ingredients in a pan on the stove then stirred in the cereal. To half I added mini chocolate chips then I pressed both halves of the mixture into a foil-lined 9 x 13 pan (and buttered the foil) – meeting them in the middle. I chose a group of college students as taste testers who wouldn’t hold back on the truth. They loved them. They said they tasted just like the regular ones – and that this recipe was nice and goey. Someone also thought that the chocolate chip version tasted like S’mores. Attune Foods is giving one winner (U.S. only because of shipping) the same three boxes of cereal that I tested – one each of Crispy Brown Rice, Crispy Brown Rice with Mixed Berries and Strawberry Crisp Cereals. Enter by midnight EST on Wednesday, March 14. The winner will be announced here on Thursday. To enter, simply make a comment here saying you’d like to win the cereal. Earn an extra chance to win by also signing up to receive these posts by email or “Liking” Enjoying Gluten-Free Life on Facebook and commenting here that you did so. Thank you for visiting Enjoying Gluten-Free Life. I truly hope you’re enjoying your gluten-free life.